Picadillos are famous in Costa Rica as one of our most typical dishes. Picadillos are small chopped vegetables seasoned with meat, like a hash, and they’re usually served as a side dish to the traditional casado and accompanied with tortillas. The most popular picadillos in Costa Rica are potato, chayote, and vainica (green beans). Less common but also delicious is picadillo de arracache and green papaya picadillo. The recipes and vegetables vary depending on where you are in Costa Rica, but all have the common denominator of vegetables chopped into small pieces with some meat. The picadillo de papa (potato picadillo) is popular in the highlands of northern Cartago, where they grow many potatoes. 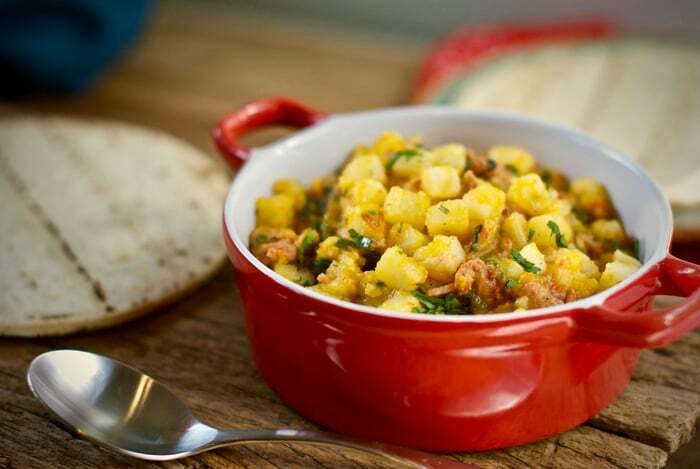 For me, this picadillo is more than just another dish. For me, it’s sentimental and every time I eat it, it brings back beautiful childhood memories of where I grew up, Llano Grande de Cartago. Llano Grande de Cartago is a small town in the foothills of the Irazu volcano with soil rich in minerals ideal for agriculture. My grandparents were farmers who grew corn and potatoes. Then my parent’s generation started growing flowers and strawberries, which are now the main crops in the area. So I grew up surrounded by agriculture, eating vegetables and strawberries we, or our neighbors, grew ourselves. The traditional potato was always an important part of our diet and we ate them as picadillos more often than not. My grandparents were not rich. My grandfather lived on a small pension and my grandmother did housework. They couldn’t afford cookies or desserts for us when we visited, but when we did, my grandmother prepared a potato hash, often without meat. Meat was expensive and sometimes they didn’t have money for it, so often it was only the potatoes chopped with onion and pepper, served in a tortilla with some coffee. But still, that dish had a delicious flavor I still remember today because its unique ingredient was love. That picadillo tasted a thousand times more delicious than if she had added kobe beef or the most expensive ingredient in the world. And that’s why this dish not only fills my stomach but my soul and my heart every time I eat it. I learned the below recipe from my mother, who learned it from her mother – my grandmother. It’s the best potato picadillo I have ever eaten and brings back so very special memories for me. Heat the olive oil over a medium-high heat in a heavy pot and once sizzling add the ground beef, bacon, onions, peppers, garlic, salt, achiote and half the cilantro. Stir frequently and cook until the meat is no longer pink. Then dice the potatoes into approximately 1/2-inch pieces and add them to the pot along with the water and oregano. Reduce the heat down to medium, cover and let simmer until the potatoes are soft – that should be about fifteen minutes. Uncover, add the rest of the cilantro, stir and cook for five more minutes to let the potatoes soften further. At this point, your picadillo de papa is ready to plate up and serve. I like to use it as an appetizer with corn tortillas, or for breakfast with some eggs. I hope you enjoy this recipe, which is about as authentic Costa Rica as you can get, delicious and simple to make. Please don’t forget to check out my book or my blog for many more recipes from Costa Rica. Melissa Guzman is the author of the book “Living Longer, Healthier, Happier – Recipes from Costa Rica”, available through her website. Born and raised in Costa Rica, she also runs cooking classes and food tours in her country. She lives in Jaco, Costa Rica. Follow her on Facebook and Instagram for more information.